A Strawberry & Vanilla Moist Sponge decorated with everything Eton Mess – sugary, strawberry-y and yum! Its no secret that I LOVE Eton mess, especially after posting my Eton Mess with Homemade Meringues recipe the other day. Meringue + Cream + Strawberries is my go-to heavenly sugary creamy dessert that I want to nomnomnom all day long! I asked my Facebook followers the other day if they had a suggestion and one happened to be this beauty – hello heaven! I have been wanted to make a next-level form of Eton Mess for aaaages but didn’t really know how, but this was perfect! 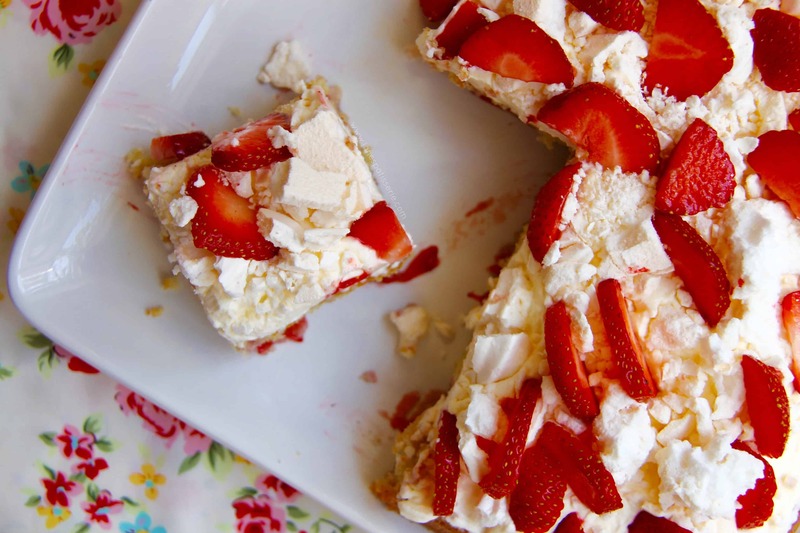 An Eton Mess Traybake Cake! 🙂 I did some research into other recipes and some included Meringue in the Sponge, and some were just Vanilla sponge with no strawberries, so I decided I would try the inbetween. I find baking with Fruit is one of those difficult ones, but strawberries in particular. This recipe works wonderful with Fresh Strawberries at the moment as its peak Strawberry season – how it would work when its not, I’m not sure – frozen might be better then! However you have to be careful. As the fruit produces so much water you don’t want to overload the mixture with strawberries so much that it just doesn’t cook, but you want enough to get the flavour! I decided a Tray Bake Cake would be better than a normal Cake as it makes a nice change, and in my opinion (and practice) its better baking consistency this way – I have never had a problem when doing it this way! Seriously though – the freshly whipped cream on top of the cake balances beautifully with the cake, and the crushed meringues adds the crunchy texture that everyone would crave – simply delectable and delicious. 1) Preheat the oven to 190C/170C Fan – grease & line a 10x10inch Square Tray with parchment paper. 2) With a stand mixer beat the butter & sugar together until smooth – add the eggs, flour, vanilla and double cream and beat again – try not to beat it too fast on a high speed, try a medium speed and don’t mix longer than necessary! 5) Once cooled transfer to your serving plate – whip the double cream up with the icing sugar so it holds itself and spread over the cake – crush the meringues and cover the cake in them, and decorate with the sliced strawberries. I find that baking the meringue into the sponge as well can sometimes turn out a bit icky, hence why I just use the cream & strawberry elements of Eton Mess in the actual sponge! This cake is best eaten on day of baking, but if you want to you can store it in a cool place for a few hours, or in the fridge for any longer! It will last 2 days! Older Next post: Rosewater & Pistachio Cupcakes! Newer Previous post: Mint Chocolate Cupcakes! Hi, could you freeze the cake before adding the topping? Thanks. Can you make this is a larger tray bake tin? I made this along with 5 other cakes for an afternoon tea……it went down a storm! One of my favourites and I have made many of your bakes and cheesecakes. Thank you! Hi Jane tried this yesterday and it was lovely! Argh! Eton Mess, I’ve been day dreaming about this all day today how weird! This will definitely be added on my list of things to try soon! Beautiful photography as always! Can you leave a conversion table for a kitchen in Arizona? Your desserts sound wonderful. I’m not sure what you mean? I have a helpful tips page which should help with converting? I’ve got a BBQ for friends coming up soon – this would be perfect! Looks delicious. I have never had Eton Mess. Not really a thing in Canada, but I may try this. This looks so delicious! I made an Eton mess bundt cake last week and pureed the strawberries in my recipe to stop them from sinking. Love that you can put them in whole in yours! Oooh do it! 🙂 and thanks!